Be the first to share your favorite memory, photo or story of Pennie. This memorial page is dedicated for family, friends and future generations to celebrate the life of their loved one. 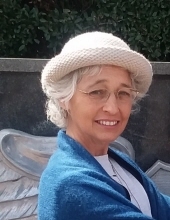 Mrs. Pennie Maree McAlhany Wendelken, 58 of Pickens went home to be with her Lord and Savior Jesus Christ on Saturday October 27, 2018. After a hard fought six year battle with cancer she passed peacefully at home. Born on May 21, 1960 in Branchville SC, she was the wife of Larry “Scot” Wendelken and daughter of Richard and Margaret Harbeson McAlhany of Branchville. She was preceded in death by paternal grandparents Joe and Rachel “Vicky” McAlhany of Branchville, and maternal grandparents Kannie and Marie Harbeson of St. George. Pennie was a graduate of Spartanburg Methodist College and Winthrop University. After college and before children she worked as an insurance adjuster for Crawford & Co. and Kemper Insurance Companies. She was known by friends and family for her love of the Bible, outgoing and cheerful personality, bright colorful clothing, and for home schooling her three smart and beautiful daughters. She was a member of Pickens First Baptist Church. Surviving in addition to her husband of 34 years and parents are daughters Lt. Abbie L. Wendelken McConnell AFB, Kansas, Ensign Amalie A. Wendelken Troy, New York, Andie Marie Wendelken Florence, a sister Patsy Davis (George) of Aiken, brothers Everett McAlhany (Sherri) of Reevesville, Wade McAlhany (Dawn) of Cope, Kelvin McAlhany (Theresa) of Rowesville, and many loving nieces, nephews and friends. The family will receive friends from 6pm to 8pm on Friday November 2, 2018 at Ott Funeral Home in Branchville; at other times friends may call at the residence of her parents. Funeral service will be conducted at 11:00am on Saturday November 3, 2018 at Beulah Baptist Church, Branchville with her Uncle Rev. David Harbeson officiating followed by burial at the McAlhany Cemetery on the Wire Road. Memorials may be made to the Beulah Baptist Church, 5502 Wire Road, Branchville, SC 29432. To plant a tree in memory of Pennie McAlhany Wendelken, please visit our Tribute Store. Lynwest Ct. Branchville 29432 S.C.
"Email Address" would like to share the life celebration of Pennie McAlhany Wendelken. Click on the "link" to go to share a favorite memory or leave a condolence message for the family.